If I could turn my office walls into video walls, I would display images from the American Southwest. There's something about sand and rocks that would provide would be a peaceful counterbalance to my computer monitors. The Navajos believe that their sand paintings contribute to general health and well being and many technical professionals make moving sand art part of the feng shui of their work space. Artwork like the ones sold at Explosion Luck can give your mind a break from coding or writing and help you refocus your thoughts. 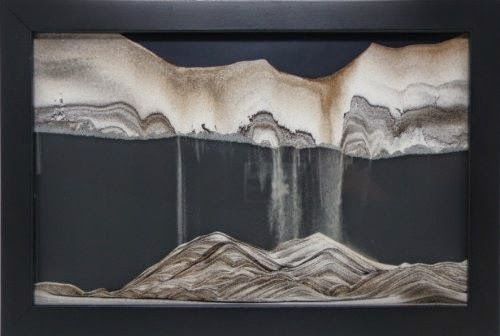 The positive energy online store offers different moving sand creations that are housed in a variety of frames. The sand drips down from upper to lower levels to create colorful landscapes. Flip the frame and the process starts over to make a new creation. Explosion Luck has more than a dozen different styles and frames with prices starting at $98. You can also check them out on Twitter.